Discussing spies on the Manhattan Project requires explaining a larger truth. The laws of physics don't obey national boundaries. The secret of the atomic bomb was that it worked. That was revealed to the world at Hiroshima. Fuchs is notorious but we should not forget Ted (Theodore) Hall (born Theodore Holtzberg). He is frequently noted for being the youngest scientist to work at Los Alamos. I dispute this. Hall was bore on October 20, 1925 while Roy Glauber was born on September 1, 1925. Both worked on critical mass calculations so they must have known each other. Hall also worked on implosion experiments. Hall passed that critical information to the Soviets through a separate network from Fucks. Unaware of the others involvement the two sources provided the Soviets important corroboration of the information they received. Hall escaped all the intense searching for Soviet spies that sprang up after the war. Supposedly the Venona Project implicated Hall in espionage but for reasons still unclear the FBI never charged him. After the war Hall completed his PhD in physics at the U of Chicago while still doing work for the Soviets. He was passing on information about the hydrogen bomb. Apparently he then began working in the field of biology using X-rays for microanalysis. Later moving to Great Britain he began working at Cambridge University where he retired in 1984. So let’s not forget the successful spies who sold out their country, had successful careers in science, and never had to answer for their crimes. Yes, the effectiveness of our “national security apparatus” to prevent espionage or sabotage or terrorist threats is highly questionable and should be thoroughly and publicly examined. Especially since Russia enjoys rubbing our noses in our failures. In 2007 Putin gave posthumously the Hero of the Russian Federation medal (highest civilian honor) to George Koval, another spy who got away. He gave the Soviets information about the initiator used in the implosion bomb. After the war he moved to the Soviet Union where he happily lived out the remainder of his life. Thanks. The initiator was one of the biggest secrets of the implosion device. Hall was certainly one of those who got away. In his "Dark Sun", Rhodes reckons that there were thousands of American-born Soviet agents whose identities we might never know. It would have been so much more productive - and patriotic - if the McCarthy minions had focused on these very real traitors instead of going after imagined "communists" under every bed. Oppenheimer was a very complicated person. It is obvious that he was willing to develop a bomb in the beginning. But, for someone with that genius and with a great responsibility, he should have been much more careful about his connections and people around him. There are so many parts in his testimony that one should be really naive to believe in them. I just can't believe, I don't know. Oppenheimer was naive and complex and he tempted fate, no doubt it. It's just that the punishment still did not fit the crime and was disgraceful. This is a little naive. In the first place, Manhattan Engineering District security was certainly as good as was practical, but nobody was foolish enough to believe it was "watertight" in any real sense. Not when thousands of people worked on it. Secondly, security from the Soviets was always a little problematic, as they were, in fact, a wartime ally, and quite a lot of people high in the FDR Administration had a great deal of sympatico with them. It certainly wasn't official policy to give them The Bomb in the 40s, but there were not a few who wouldn't have pressed too hard to ensure it wasn't done. The reason it all changed was largely because of what, to the naive American left, felt like Stalin's incredible and horrifying betrayal in post-war Eastern Europe -- I mean, what did we fight the war against Nazi Germany for if the only people who would end up freed were the French? The failure of Stalin to abide by Potsdam was a seismic shift in all but the hardest core American lefties. *Then* the prospect of Stalin with The Bomb became anathema. Horse, barn door, et cetera. Finally, there are a number of places were Oppenheimer clearly dissembled (e.g. about his brother's ties to the CPUSA) and almost certainly lied (Haakon Chevalier). Given the *immensely dangerous* knowledge locked in his head, Oppie's willingness to play games with the strict truth was a very good reason for the government to ride him much harder than any ordinary schmo. Oppie did it to himself. He didn't *need* to give the finger to the admittedly stolid and annoying security rules, he could have just done what he needed to, but his ego and his streak of flakiness wouldn't let him. That he was factually innocent is beside the point: he certainly did enough to raise reasonable fears, and he did so for whimsical and silly reasons (which it's hard for people of less intelligence to understand). He might as well have been Robin Williams making a hilarious joke about bombs in a TSA line. Very funny, yes -- but off you go for the cavity search, and whose fault is that? Do Not Tease The Animals. And then what...? Had the whole line been shut down until Stalin's death, it would have been eight long years of an American sole possession of the weapon. Perhaps Stalin *would* have felt compelled to honor Potsdam, and Eastern Europe would've been free in 1945, instead of 1991. And without a Soviet A-bomb and Stalin's betrayal (which hit him hard), Truman might not have seen the need for the H-bomb, and might even have pursued an agreement with the Soviets forswearing their use. It's possible the nuclear arsenal of the world might've remained at a few hundred 150kt boosted fission weapons delivered by B-52. Not nearly as hideous and expensive as 20,000 300-750kt thermonuclear warheads on Minutemen for a few decades. Thanks for your comments. I agree that Oppenheimer dissembled and made up stories. But I disagree that that behavior warranted this kind of unconstitutional and disgraceful hearing. 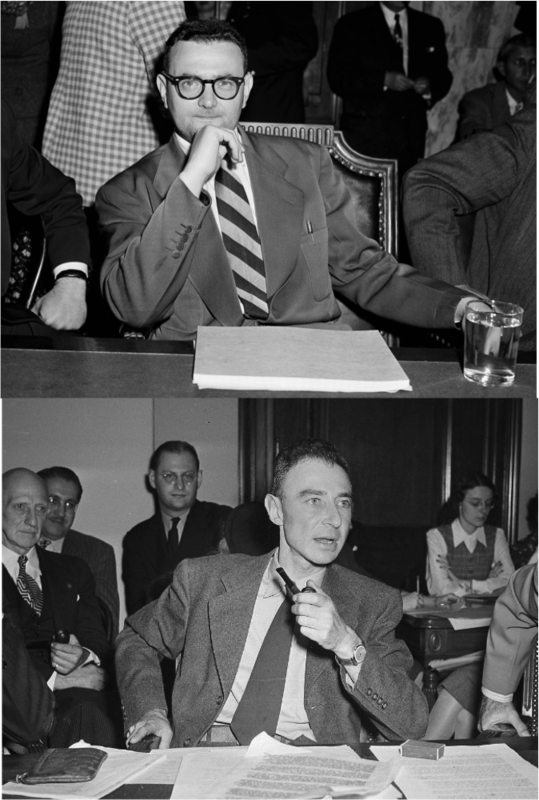 It's a question of the punishment fitting the crime, especially when the so-called "crime" had been dismissed before when Oppenheimer was vetted for the project. Rabi summed up my feeling about the hearing best: "He's a consultant, and if you don't want to consult the guy you don't, period." > He was so unbelievably paranoid that it was *only* by following a design they absolutely knew would work (because it was stolen from the Americans) than any Soviet scientist of the required intelligence was willing to stick his neck out and try for a bomb. Is that really true? The way they did the Uranium isotope separation was very different from the way the Manhattan Project did it (they got the better Germans in that case).